A regular rotation in my August/tomato menu, this savoury pastry is lovely alongside a simple soup and salad, making for a filling meal with little effort. Preheat the oven to 375 degrees F. Lightly oil a 10-inch tart pan with a removable bottom and set aside. 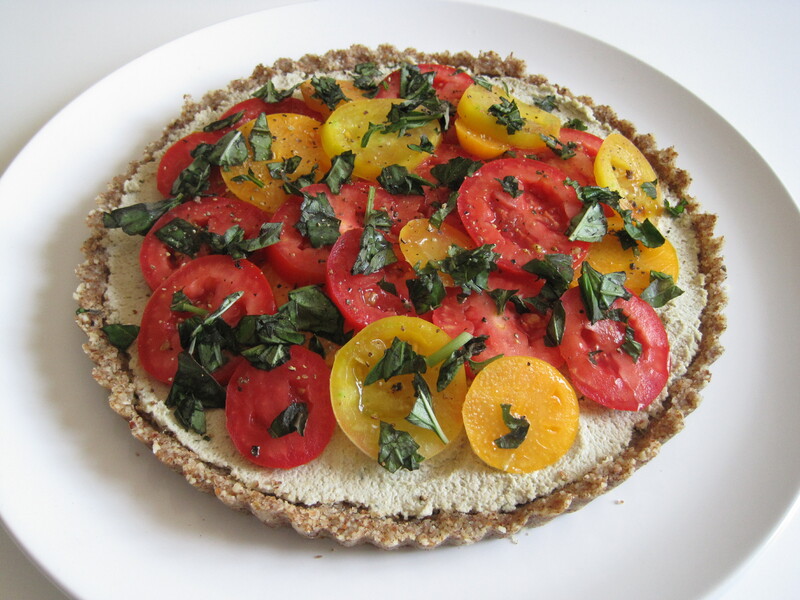 To begin with the crust, whisk together the sorghum flour, arrowroot flour, quinoa flour, xanthan gum, salt and Italian seasoning. Add the olive oil and stir to blend. Slowly add the cold water, mixing in just enough to create a soft dough. Transfer dough to a floured work surface and knead about three times for it to come together. Do not overwork the dough — it will become tough. Roll dough into a circle two to three inches larger than your tart pan. Carefully fold the dough over your rolling pin and place it in the centre of your pan then use your fingers to gently press the dough into the crevasses and up the sides of your pan. Trim the edges and patch if necessary. Set aside. For the filling, place the tofu, lemon juice, nutritional yeast, Italian seasoning and garlic in the food processor, and pulse until crumbled. Season with salt and pepper to taste, and adjust seasonings if desired. Spread tofu filling into prepared tart pan, filling it about 2/3 of the way from the top. Depending on the size of your pan, you may have some left over. Starting from the outer edges, lay the tomatoes on the ricotta filling, overlapping as you work your way around, until the top is covered. Tuck in the red onions randomly. In a small container, mix together the olive oil and agave nectar, and brush tomatoes with the mixture. Season with salt and pepper. Bake for 30 to 40 minutes until the crust is browned and the tomatoes and onions are cooked through. Remove from oven and sprinkle with fresh basil. Serve at room temperature. 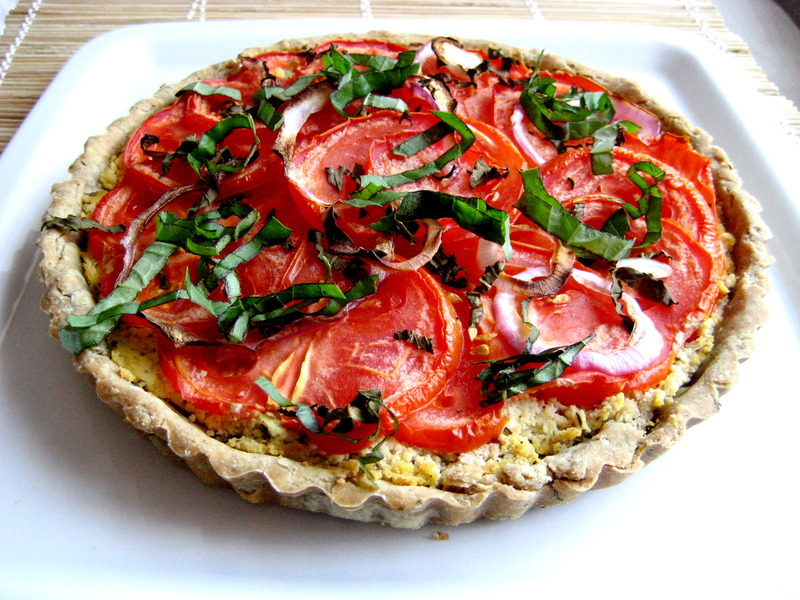 An easy to put together tart highlighting juicy tomatoes and fresh basil. Feel free to add herbs, garlic, fresh ground pepper, and other ingredients to the basic “cheese” recipe to suit your favourite flavors. The sunflower seed cheese process needs to be started a day ahead with some soaking. 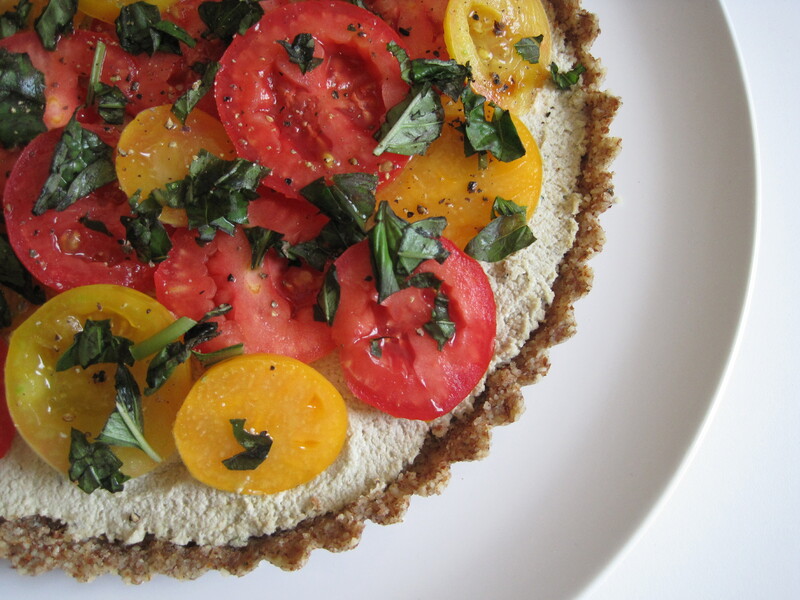 To make the crust, put the almonds, flaxseed, basil, and salt in a food processor. Process until the almonds are finely ground. Drizzle in the coconut oil. Pulse about 6 times to mix. Add the water, a tablespoon at a time, pulsing just until the mixture begins to stick together. Scrape the mixture into a 9-inch tart pan with a removable bottom, pressing firmly into the bottom and up the sides. Transfer to the refrigerator. To make the sunflower seed cheese, drain the sunflower seeds and put them in the food processor with the remaining ingredients, scraping down the sides as necessary (add a few splashed of water, if needed). Test for seasonings, adding additional salt, pepper, or lemon zest if desired. Spread the mixture onto the crust. Top with the tomatoes, basil, salt, and pepper. Refrigerate for at least 1 hour before serving. 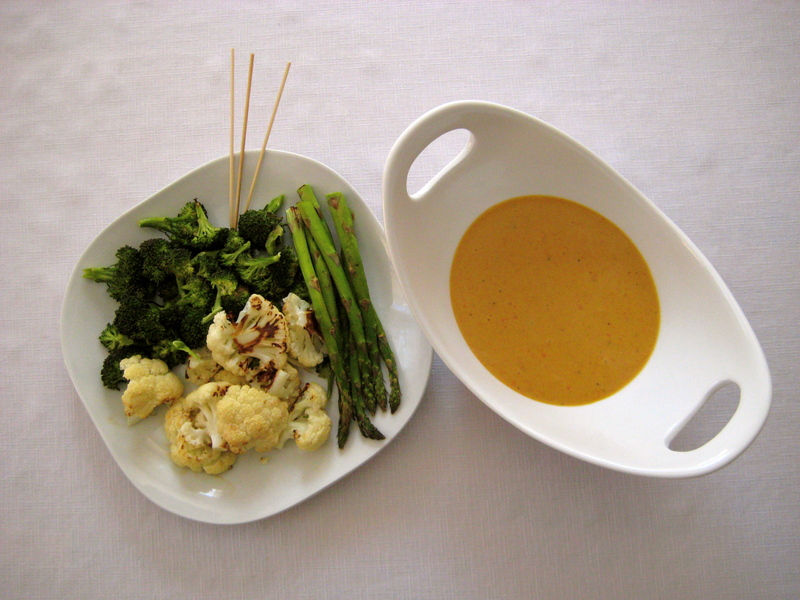 Choose any vegetables you love to dip, or use as a cheesy sauce. The cumin and peppers add a slightly Mexican flavour, making it top-notch for nachos, too. Preheat oven to 425°F (220°C). Cut the vegetables to a uniform size and toss with olive oil. Sprinkle with salt and pepper. Roast until tender. I recommend cauliflower (about 25 minutes), broccoli (about 20 minutes), and asparagus (about 10 minutes), all perfect for dipping. Put the water, nutritional yeast, beans, roasted red peppers, tapioca starch, lemon juice, cumin, onion powder, and garlic powder in a blender. Blend until smooth. Sample for salt and pepper, adjusting to taste. Pour the mixture into a medium saucepan. Cook on medium-high heat, whisking frequently, until thickened, about 6 to 8 minutes.